Quite why it’s taken me so long to invest in decent headphones, I’ll never know. For the longest time, I made do with the free in-ear buds that come with most new mobile phones. The ones Samsung provide on their flagship Galaxy range are okay, but really just for casual use. I listen to music at work for 4 – 6 hours most days. I also tend to wear earphones when walking around on my own, especially for those mundane trips to the supermarket or grabbing a coffee. In other words, I’m pretty reliant on headphones on a daily basis. One day, I decided I’d had enough and wanted good quality sound on the move. Active noise cancellation was a key requirement, as well as comfort and good battery life. I was prepared to invest a decent amount if the product justified the price – I fully expected to get plenty of use out of them. After some initial research, I narrowed it down to the Bose QuietComfort QC35, or these Sony WH-1000XM2. My local John Lewis store had both available to try, so I went in and spent a decent amount of time with each one hooked up to my phone. I tested them with a variety of my favourite EDM tracks to compare sound quality. In my mind, I saw wireless headphones as gimmicky – unreliable sound, terrible battery life, heavy and uncomfortable to wear. Both the Bose and Sony proved these assumptions to be false – they were equally comfortable, had excellent battery life and sound quality that easily justified the £300 price tag. What tipped me in favour of the Sony was the sound quality itself. The Bose perhaps edged out in front on comfort, feeling lighter and with less pressure on my ears, but it was very marginal. I found the sound on the Bose to be less suited to my dance/trance music – the bass felt weaker and the Sony had a wider sound stage. The Sony’s were like being on the dancefloor at a nightclub, while the Bose were more like listening from outside. (Probably a harsh analogy, but they definitely felt weaker). 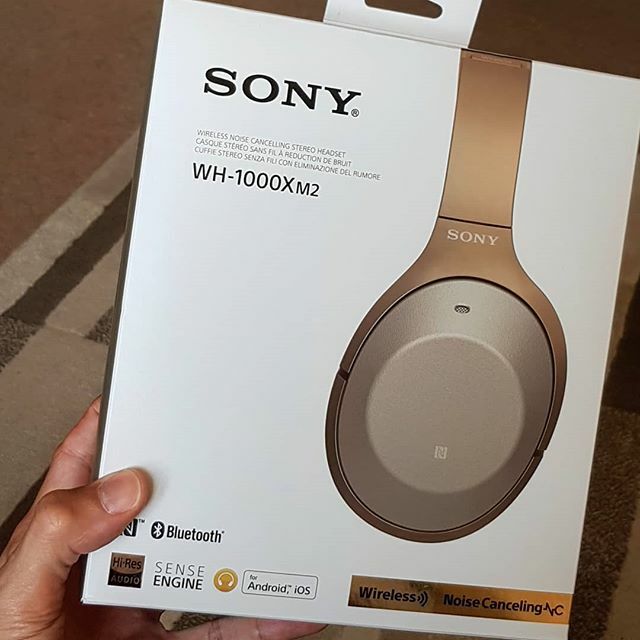 I’ve now owned the Sony WH-1000XM2 for 7 months and they’re still one of my best purchases, in spite of the high price tag. I’ve had hundreds of hours usage and they still sound amazing to me. The battery will usually get me through a week on a single charge, and it’s fast and easy to top up when they do run low. I do suffer some ear compression soreness with extended use (3+ hours solid), but that’s partly because I wear glasses and even the soft padding does eventually press them into my ears. Removing them for just 10-15 minutes fixes it though, and I think this would be the case with any headphones – they need to be a relatively tight fit for the noise cancellation to work, or sound would leak in through the padding.